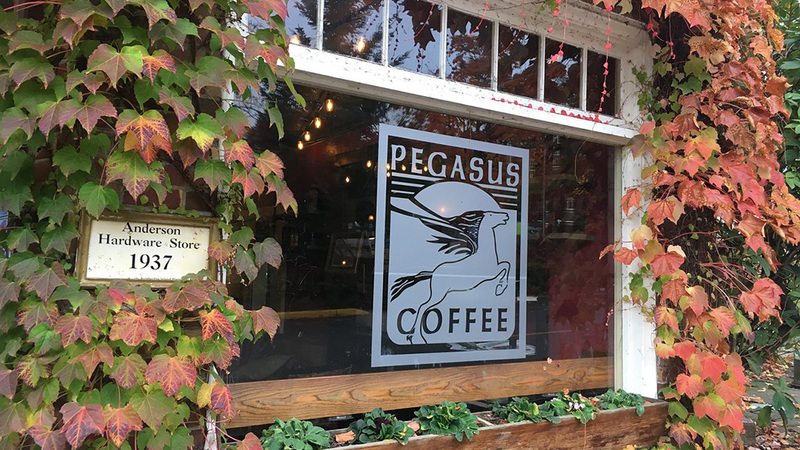 Pegasus Coffee House is a friendly place serving good food, tasty beverages and community love to Bainbridge Island visitors and locals for 40 years from our ivy-covered Eagle Harbor home. Pegasus has always run on love: love in the made-from-scratch food by executive chef Kell Killian and his merry band of friends and family, and in the locally-sourced ingredients, goods, and drinks they serve. Pegasus loves to showcase the best of produce and caffeine-fueled and alcoholic beverages from Bainbridge and beyond, joyfully shining a spotlight on the Pacific Northwest’s finest business, farming, and artisanal community partners. The best way to sample the Pegasus experience is to drop by our waterfront landmark building on Parfitt Way – but if you aren’t on the island today, you can now always visit our online store and get freshly-roasted beans delivered to your door, along with a variety of gifts designed to help you share the Pegasus love.